U.S. Marshals, with the assistance of the FBI, positively identified "Bobby Thompson" as cold case fugitive John Donald Cody at a news conference. 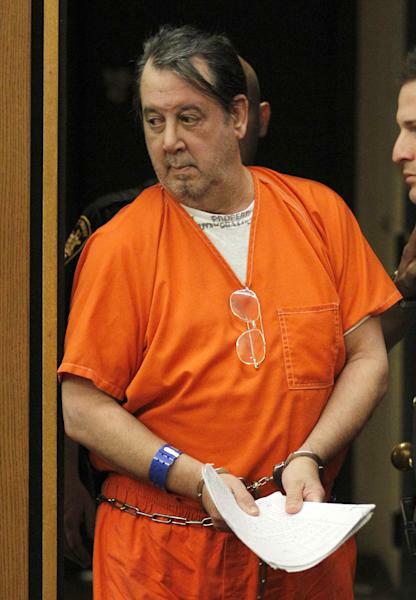 CLEVELAND (AP) — A former fugitive suspected of running a $100 million cross-country scam collecting donations for Navy veterans has been identified as a Harvard-trained attorney wanted on unrelated fraud charges since 1987, authorities said Monday. U.S. Marshal Pete Elliott said the man who identified himself as Bobby Thompson and signed legal papers as "Mr. X" is really John Donald Cody, 65, whose true identity was uncovered through 1969 military fingerprints in a database separate from the national crime system. Earlier checks of the criminal fingerprint database turned up nothing on Thompson's true identity. He is jailed awaiting trial on charges of defrauding donors in 41 states of up to $100 million through a bogus Florida-based charity. A four-count indictment filed in 1987 in Alexandria, Va., charged Cody with looting the estates of two women by making off with $99,000 from traveler checks purchased in Sierra Vista and Fort Huachuca, Ariz.
Elliott said at a courthouse news conference in Cleveland that the fingerprint match developed from tips he found last week doing Google searches for information about the suspect, including possible military or fraud backgrounds involving a missing person. Elliott said he found a wanted poster for a similar-looking pompadour-wearing man who had disappeared after being accused of defrauding a legal client. The FBI searched military fingerprint files and found Cody's prints matched those taken from the suspect when he was arrested this year. The suspect had served as a captain in U.S. military intelligence, Elliott said. Elliott said military fingerprint records were only checked last week after Google searches for a possible military-related suspect turned up the Cody wanted poster. The FBI chased his prints from military service more than 40 years ago and they matched Thompson's, Elliott said. "John Donald Cody was never arrested; he was indicted. When somebody is arrested, they come into our custody and they are arraigned," Elliott said. "There was no fingerprint from that time. The only prints we found were from 1969 that the FBI sent us." The FBI said it checked the military print records when Elliott requested that. "When he reached out to us last week with this possibility then, yes, we assisted in identifying him. But up until that point, there was no reason to reach out to us," FBI spokeswoman Vicki Anderson said. Elliott also said the FBI wanted to question Cody about an espionage case but gave no details. There was no immediate comment from the FBI beyond congratulating authorities on his arrest. According to the marshal, Cody graduated from the University of Virginia in 1969 and Harvard Law School in 1972 and practiced law at several locations around the country. UVA said a John Donald Cody received a bachelor of arts degree with high honors on June 8, 1969, and Harvard confirmed a John Cody graduated from its law school in 1972. During an earlier appearance in court in Cleveland, the suspect had mentioned the possibility of representing himself. He told a judge on May 10 that he wasn't an attorney but wouldn't say if he has a law school background because that related to the issue of identity theft. His attorney, Joseph Patituce, said he is preparing for a March 11 trial. "We believe that the state has a very weak case against our client, but we look forward to our day in court," he said. Over the suspect's objections, a judge granted the state's request to take his palm prints and handwriting and DNA genetic samples as authorities tried to identify him.